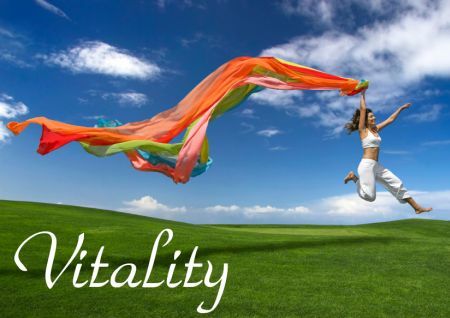 The online dictionary defines Health as "the condition of being sound in body, mind and spirit" and Vitality - "the capacity for survival or for the continuation of a meaningful or purposeful existence." Doesn't that sound like what our goal should be if we want to live a long, happy and fulfilling life? How to get to this goal has been something that has been researched, discussed, pondered, and argued throughout the ages, and unfortunately still is today. I don't pretend to have all the answers. All I know is that after many false starts I've finally found what works for me, and from all the testamonials I've read, for many others as well. 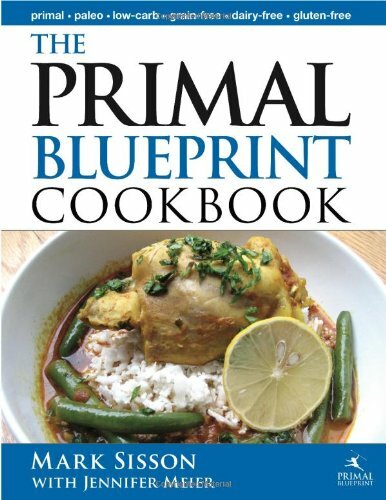 The Paleo lifestyle, specifically the Primal Blueprint written by Mark Sisson, is the guideline I now folllow, and since I am writing this blog specifically to make this way of eating as easy as possible, I think a brief overview of the Primal Blueprint is in order for those of you who may be just starting on this road, or not totally familiar with this version of Paleo. 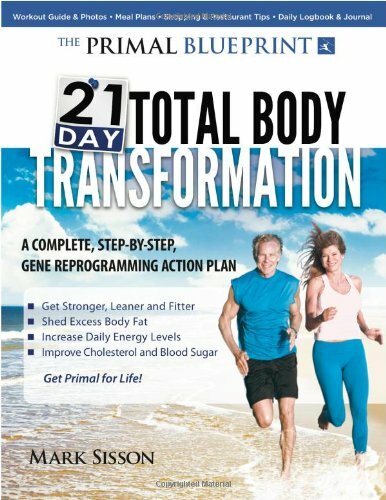 I do recommend that you buy one of Mark's books - whether it's this one or his newest one, the 21 day program. 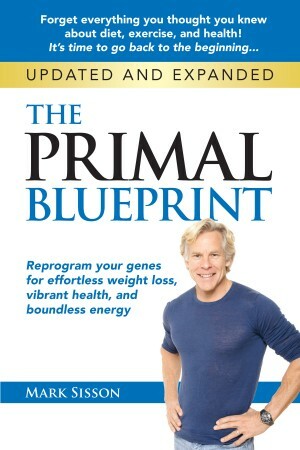 If you really like lots of scientific background and explanations as to why things work the way they do, the Primal blueprint is your book. 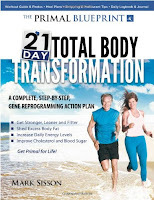 If you really aren't that bothered about the science and just want to know quickly and as easily what he recommends, then his new book, the 21 day total Body Transformation is ideal. In the first few pages you will learn everything you really need to know to get with the plan, and the rest of the book will give you lots of answers to any questions you might have. It's also full of beautiful photos which does no harm when you tend to be visual like I am. And of course there is Mark's website marksdailyapple.com were he covers just about everything in his daily blogs. 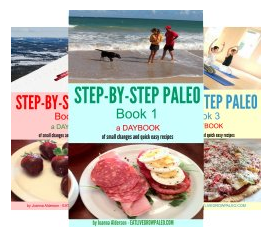 You really don't need to buy any of these books because he covers everything very thoroughly on his website, even giving you lots of recipes, but if you try this lifestyle and like it, then I think paying him for the knowledge by buying one of his books is only fair. And if you prefer he has two recipe books that you can buy instead which are wonderful to own, whether physically or the ebook version which you can use on your iPhone or your Ipad. 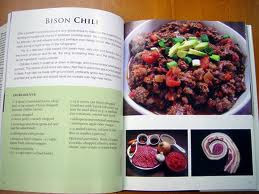 His quick and easy cookbook, especially is my favorite because it's .....well, quick and easy. And I especially like the way he presents both the ingredients and the finished product in his photos. But let's get down to the nitty gritty. 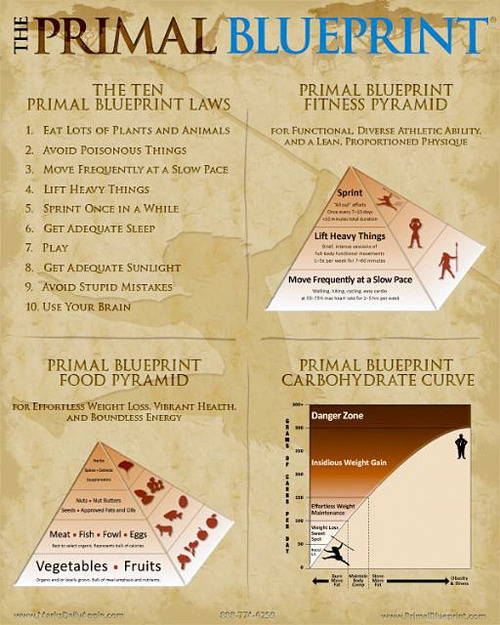 What do YOU need to know to start living by the Primal Blueprint? "How can I get lean and functionally fit for life with minimal time commitment, pain, suffering and sacrifice and, more importantly, with as much fun, enjoyment and ease as possible?" His answer was to return to how our ancestors lived - give or take a bit of useful technology. Eat healthy food. 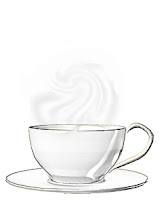 Give up grains, processed foods, milk and legumes. Heavy cream and cheese can be eaten in moderation along with healthy oils (olive,nuts,avocado) and occasional red wine and dark chocolate. Fill up on vegetables, add good protein sources (no soy) and fruit in moderation, mainly berries. Exercise moderately. 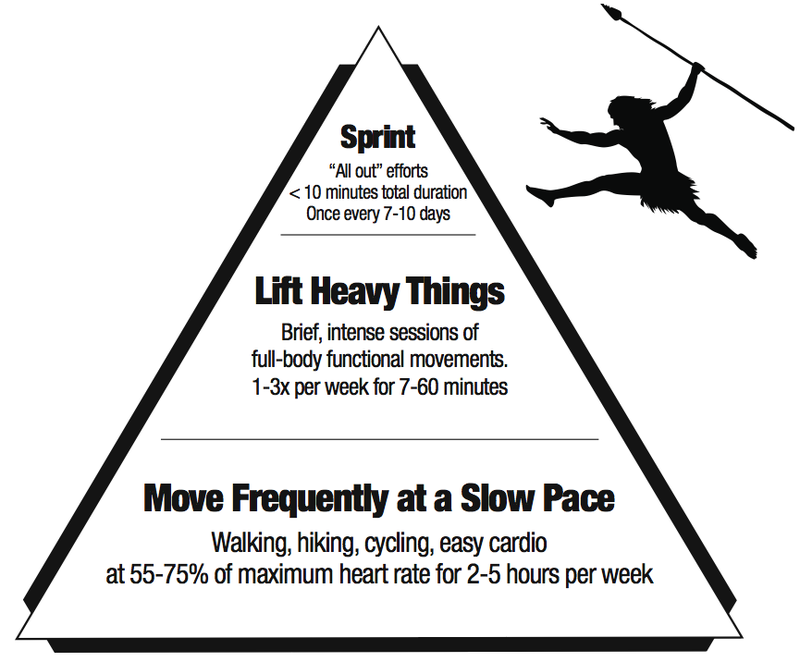 Incorporate occasional sprints and a couple of short workouts a week, but mainly just keep moving and participate in fun activities that require you to move as much as possible. Live a healthy lifestyle. Get more sleep - at least 7 to 8 hours in a completely dark room. Make it a priority in your life to work at reducing stress and creating more opportunities to relax. 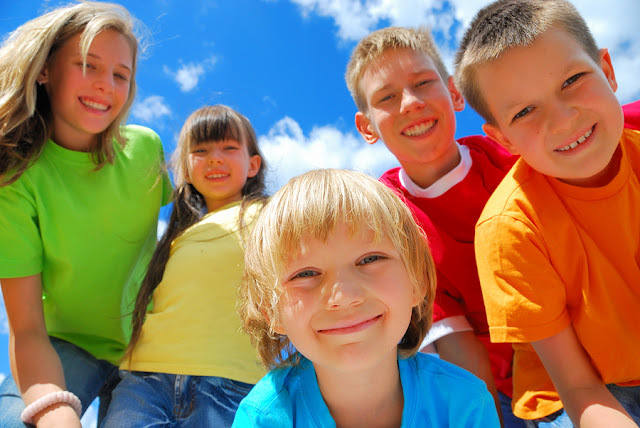 Get some fresh air and sun exposure every day, and walk barefoot when possible. That is it essentially. How to do this is the subject of his books, his blog, and many others like mine, but really that's what it boils down to. If you are visual like me, here are three charts that explain it all - his food pyramid, his exercise pyramid, and finally his Carbohydrate Curve. These are all available on his website by the way, along with a more detailed quick start post that gives you tons of info. right up front. 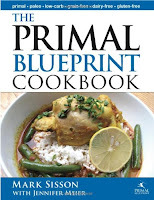 Just as there are many variations of the Paleo lifestyle, there are also variations in how people will follow the Primal Blueprint. 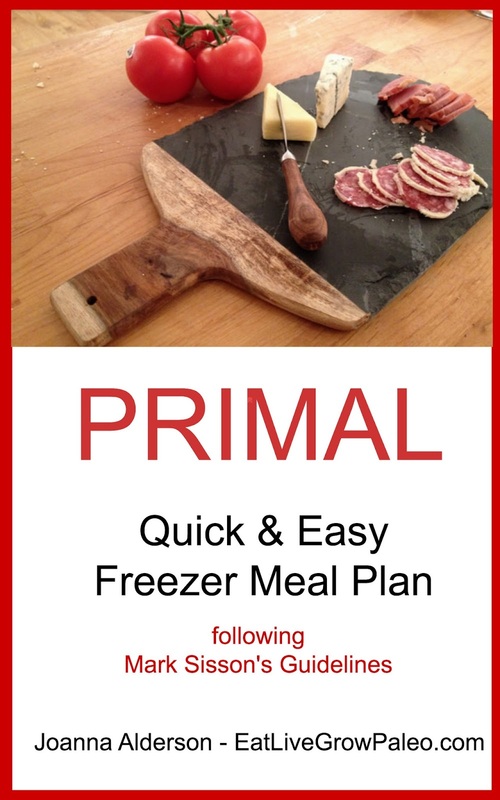 It seems to me to have a lot more flexibility than many other Paleo plans, and this is exactly why I chose it. If you are lactose intolerant you don't need to eat dairy to be successful, and some vegetarians do have soy (though if that's you really check for no GMO). Even though Mark and his daughter both eat meat, his wife only eats fish and some protein shakes, and his son is completely vegetarian, so his family alone is the perfect example that this plan can work for pretty well everyone. It's really the main principle that's important. Stay totally away from processed foods, and by that I mean frozen dinners and "health foods" in boxes and cans. We all use some processed items. It's hard to find red wine or dark chocolate running from a stream in the ground or growing on trees (wouldn't that be nice!). Just use sense when choosing these things, use them in moderation, and you should be fine. Make most of your food from scratch. That way you will know exactly what goes into it, and if you need help knowing were to start, well that's what I'm here for. Hopefully at this point you can now see that this is not just some "diet" craze. It's a "way of life" that has a huge following because it really works. And whenever you need inspiration, all you have to do is read some of the thousands of testimonials on his website or read some of the comments on his blog posts and in his forum. Oh yes, he has a forum as well. The main goal of Primal Eating isn't weight loss, it's health. But Mark maintains that when you eat this way your body automatically drops to whatever is your ideal weight, and certainly it's worked that way for many. This is where his Carbohydrate Curve comes in. 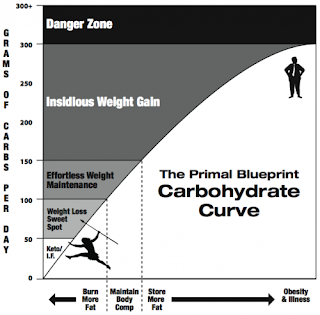 If you are morbidly obese you can lose quickly and safely by staying under 50 grams of carbs per day, but for most people who need to lose weight, 50 to 100 carb grams daily is the magic zone. Somewhere between 100 to 150 is what most people find allows them to maintain once they have reached their ideal weight, and over that you're asking for trouble. This doesn't mean you need to count carbs. You really don't need to count anything if you eat this way. Usually it will just work automatically. But if you reach a plateau, your carb count is a good thing to check for a few days to make sure you really are eating "in the zone" and not just kidding yourself. It's very easy to overdo all those things you're supposed to have in moderation. 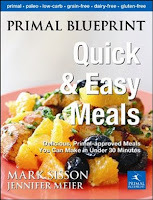 Lastly, Mark is realistic about life in today's world, and even though he believes we need to eat as closely as possible to the way primitive man ate, he also knows that our food (for various reasons he writes about on his blog) no longer gives us the same kind of nutritional value, so we need to take supplements. He has a line of his own and I can tell you from my experience that they work - and believe me I've tried a lot of supplements in my time. I've gone from nutritionists to herbalists to anti-aging doctors in my quest for health and I used to take handfuls of supplements each day with varying results. I don't worry about any of that any more. Now I take just the few Mark recommends, but those few, along with following his life plan (and it really is a LIFE plan), make me feel stronger, healthier and more energetic than I have for years. He also sells a low-carb protein powder shake meal replacement made from coconut and sweetened with Stevia which I sometimes have for a meal when I'm just too busy doing something to bother with a real meal. I don't really need this in my diet - it definitely is a luxury - but from people who want to build muscle or who do a lot of training, I can tell you it's had a lot of great reviews. Mark does have a scientific background so I do think he knows what he's talking about. 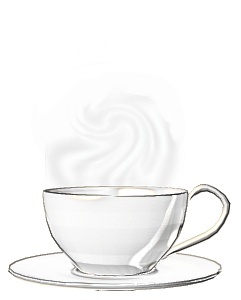 His products are well worth considering as extras to help your nutritional program, but are not necessary to live healthily on this lifestyle program. However I suggest you read his posts on supplementation before you decide whether or not supplementation (whether his or from another source) is for you. If you decide to give Mark's plan a try, I've got something for you. I've written a book that contains a complete 4 week menu plan to get you started. 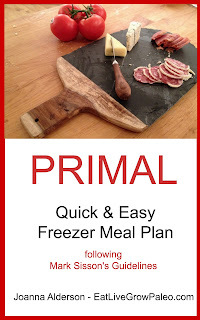 The PRIMAL Quick & Easy Freezer Meal Plan: following Mark Sisson's guidelines also outlines a plan for filling your freezer with heat-and-serve meals so you can drastically cut down on the amount of time you will need to spend in the kitchen. I know I keep sounding like an advertisement for Mark Sisson, and in a way I guess I am. Certainly I'm among his biggest fans - and he has many. The amount of information and work that has gone into his website is truly phenomenal and he deserves every penny he makes on his products and books as far as I'm concerned. I love this lifestyle he has created, and because I think its could have a huge effect on curbing the growing obesity problem in the world, I want to help sell it to as many people as possible. 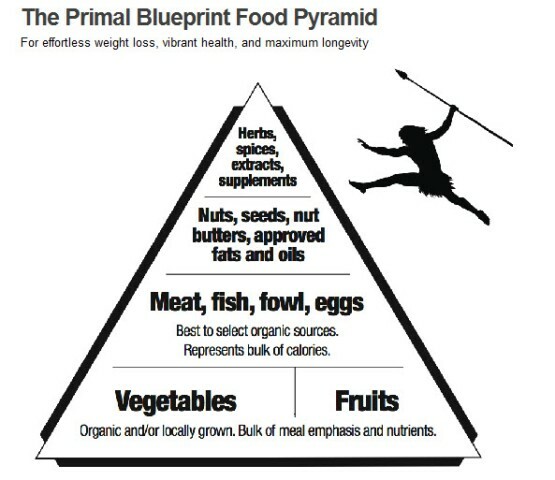 The multi million dollar diet industry isn't going to change the world any time soon (especially if they keep pushing grains and the low fat thing), but if enough people get on this Primal Paleo bandwagon, we could see some very real and very positive changes for our generation and the generations to come. As someone who is concerned about her children and future grandchildren, that's very important to me, and definitely worth putting in the effort required to write this blog and do my bit. Jus started reading your Amazon book. Thanks for honest and balanced information. Looking forward to reading more.